Has it really been this long since I've posted? I'm a bad, bad blogger. 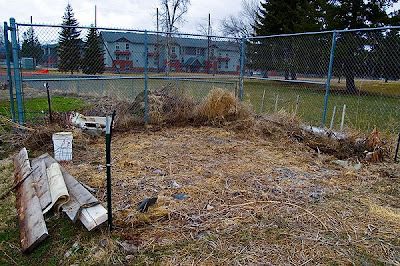 If I'm feeling especially guilty, I'll get around to posting pics of the new starts later tonight, but before I get ahead of myself, I should share today's exciting adventure: sign-up for community garden plots! The whole day was overcast and cold. Most folks showed up, signed up, and saddled up pretty quickly - we were two of the few who stayed to work. I admit, when it started snowing, I had plenty of thoughts of leaving but stuck it out till we met our goal of lining one plot and turning another. 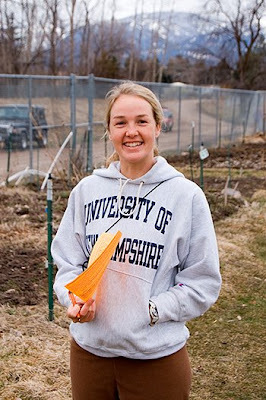 Here's Stacy, community garden coordinator-extraordinaire. And the Handyman tackles edging his plot. Before spending too much time thinking about it, I asked why they use grass when it's constantly creeping into the plots. 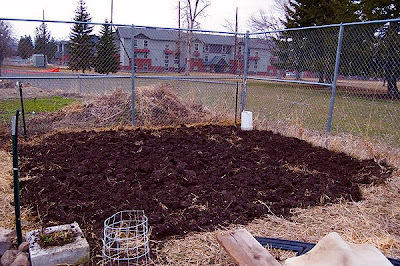 Turns out, it makes a whole lot of sense - dirt would get muddy and gravel/rocks would still need weeding. I suppose it would be kind of expensive to put in pavers, so grass it is. 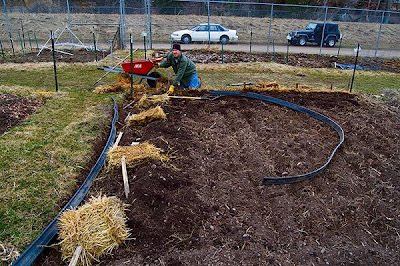 The Handyman dug back the grass, put in a liner, and used the straw to buffer the liner inside the plot and on top of the edge outside the plot. We're pretty excited because we're going to have good company out there this summer. Jenny, Jordan, Heather, and Martha all got plots. 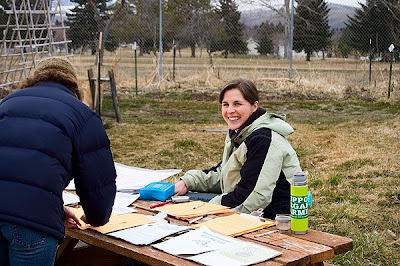 This is Martha with her sign-up sheet and "I-really-like-the-plot-I-just-picked-out" smile. Well it looks like you are going to have a good group!